So the plans with this month's post went left when I wanted it to go right. Once we put the outfit on, it looked like pajamas and I just couldn't. Although they looked like very nice looking pajamas, it was pajamas no the less. The rest of that fabric will be for another date and time. 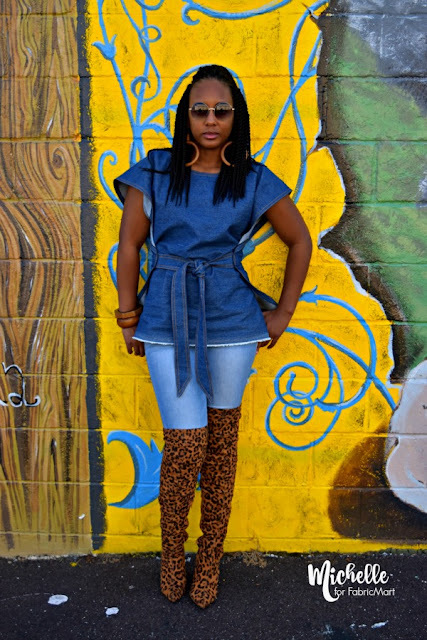 SOooooo although Fabric Mart does not have anymore denim right now, but I still wanted to post this DIY wrap shirt tutorial. 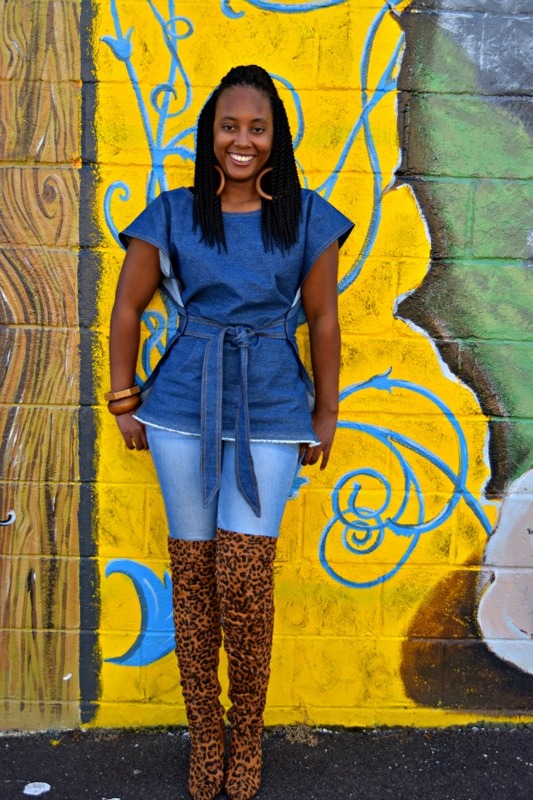 I have seen this wrap shirt several times on Pinterest and several versions but I didn't see any made in denim. 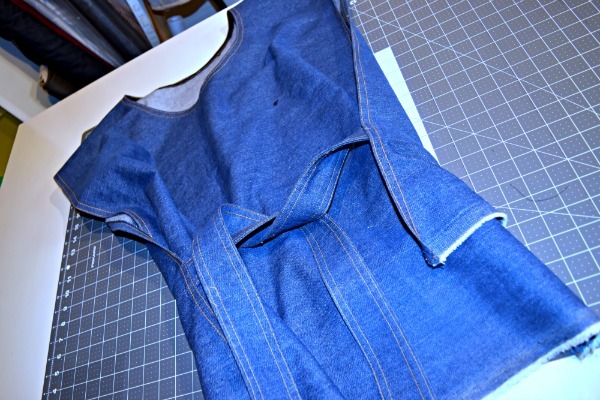 You know how much I love working with denim, so denim it was. I pinned Hartfabrics.com version to my DIY'd board and that is what I used, with a few modifications. Most of the tutorials that I saw called for one yard of fabric, 44 inches wide and the shirts ties at the waist. 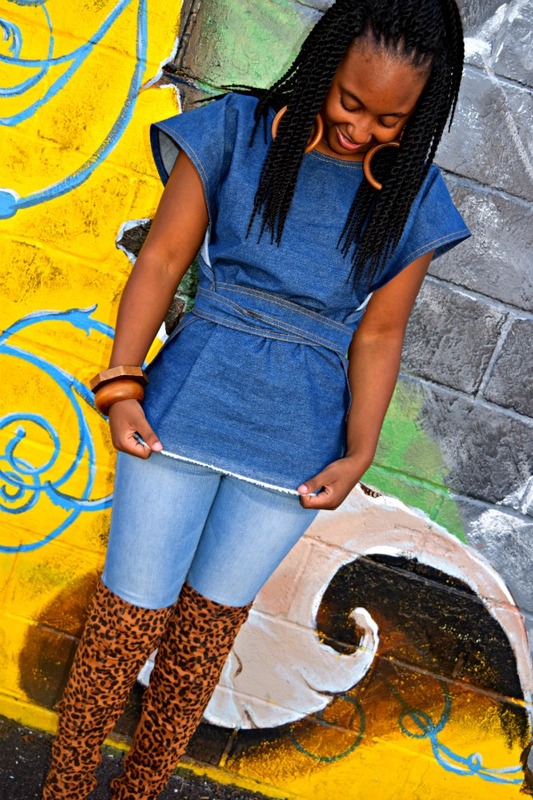 But I wanted a longer version of this top. 1. 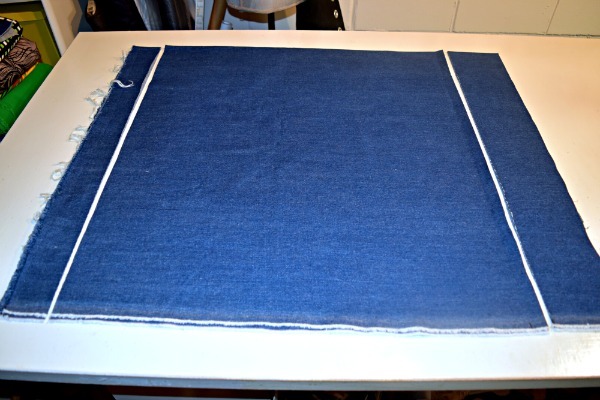 Cut fabric into three sections 2"X54" 27"X54" 5"X54"
Fold them in half and press. 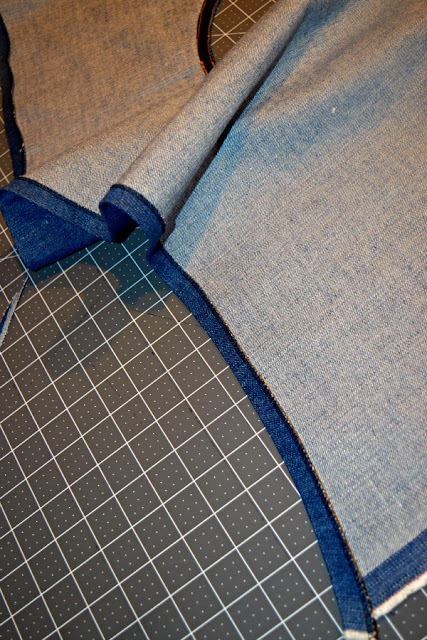 Fold each side into the middle and press. 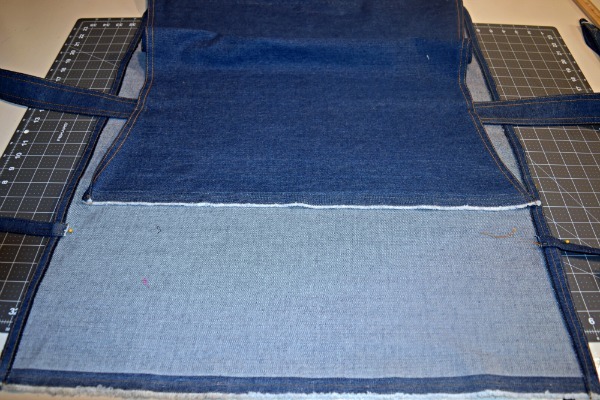 Fold in half, press and top-stitch. 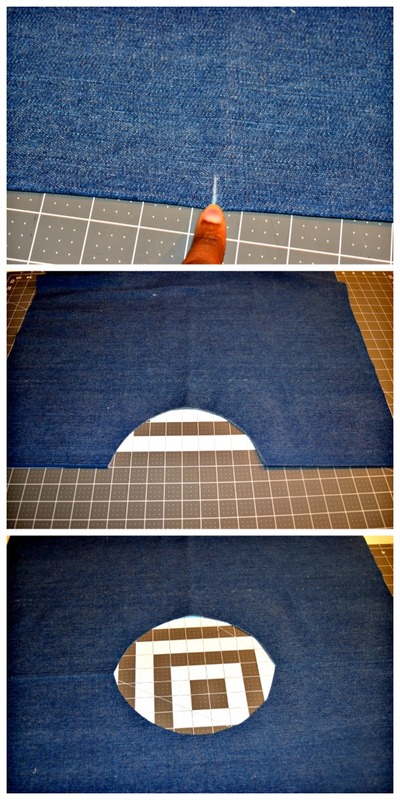 Fold in half, right sides together with a slant at one end. 4. 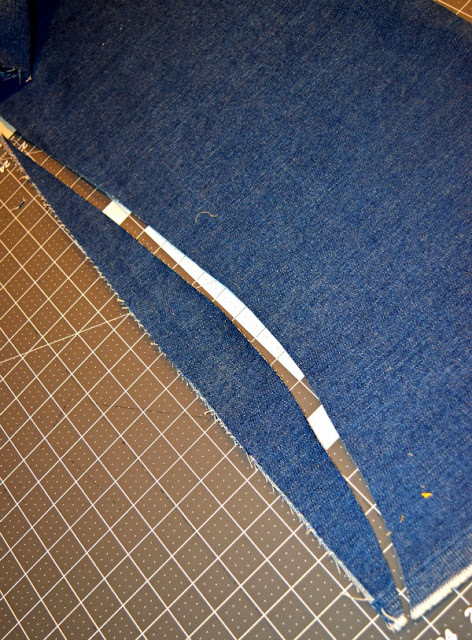 Mark the center of your big piece for your neck opening. Use a round object to make your half circle. 7. 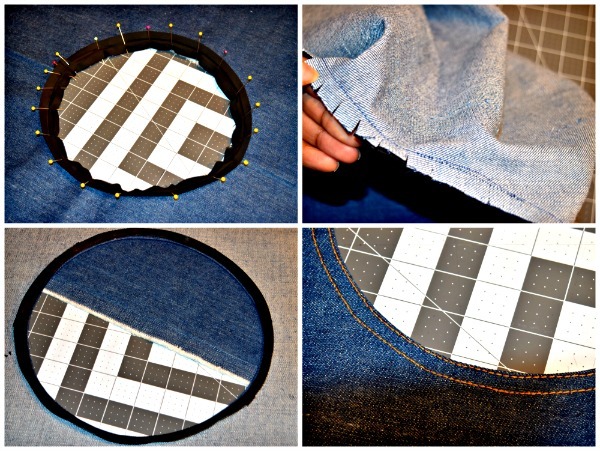 Hem your sides and bottom. 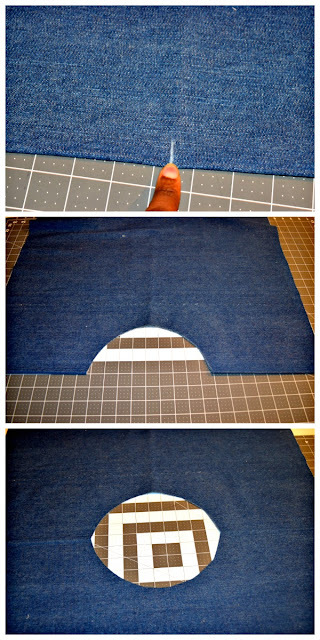 You may want to double fold all the way around and hem. I serged my ends and folded once and top-stitched. I left my bottom salvage edges as they were. Here is what you should have right now. Your thin straps, your shirt and your thick straps. 8. 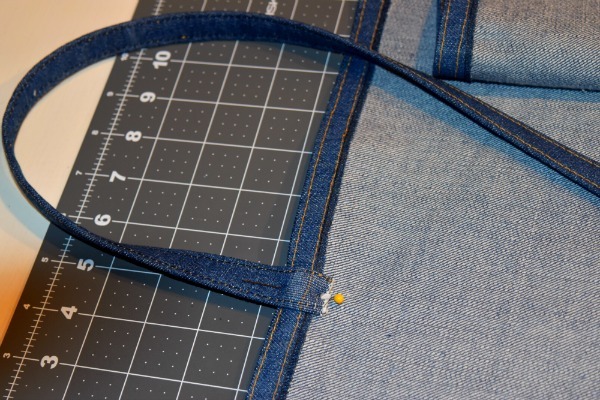 Now you will need to measure to determine where you want your shirt to wrap at. I originally measured down 22 inches. I ended up moving my straps up about 5 inches higher for this version. When I chose denim I was aware that some of the inside of the denim would be visible when wearing this wrap shirt. 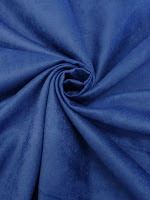 Keep this in mind when choosing fabrics if you decide to give it a go. 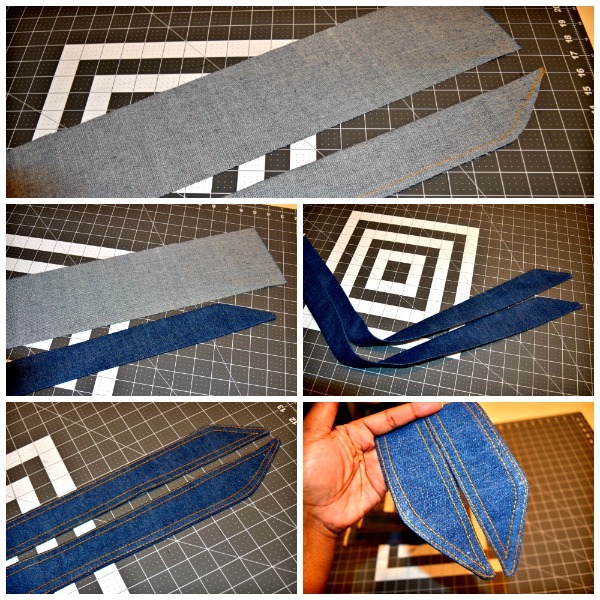 Put it over your head and tie the skinny straps in the back and now wrap the back straps to the front. You can tie the belt in front or if it's long enough like ours was you can tie it in the back. 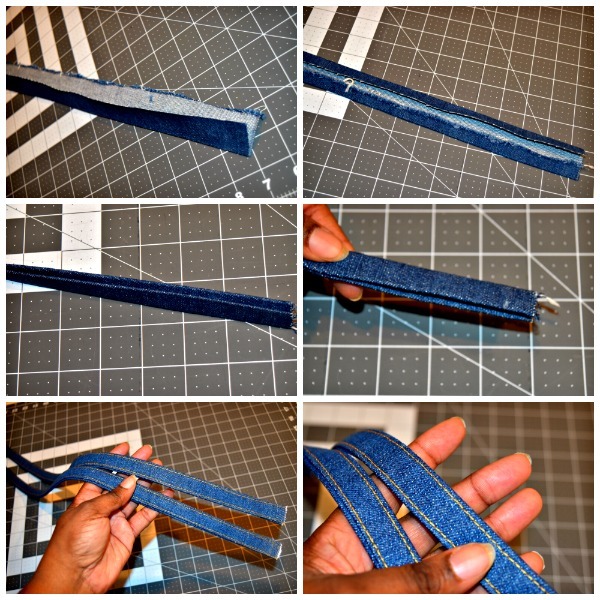 **You will need to trim you skinny straps but try it on and make the decision on how short to cut them. 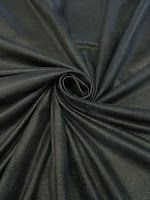 Here some options available now but I bet they have bunch of new fabrics coming soon! Thanks for watching folks! Until next time. Looks great. I like the suggestion of the raw silk, your first suggested fabric. 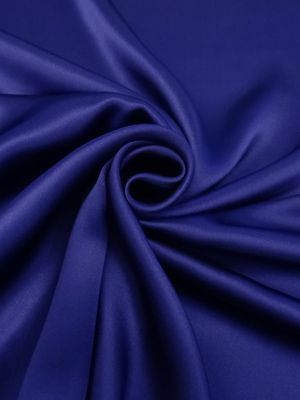 The slight stiffness and unevenness of the thread size in raw silk would be perfect made up this way and the texture and no right/wrong side would work well also. 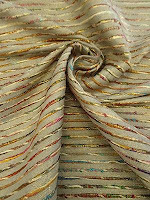 Robin I got my eyes on that silk and I did see that in person and it is divine! You're right this could be a topper to a turtle neck as well. I think I need one of these! I think you need to make one as well! Really cute, as is everything you make and Mori too! 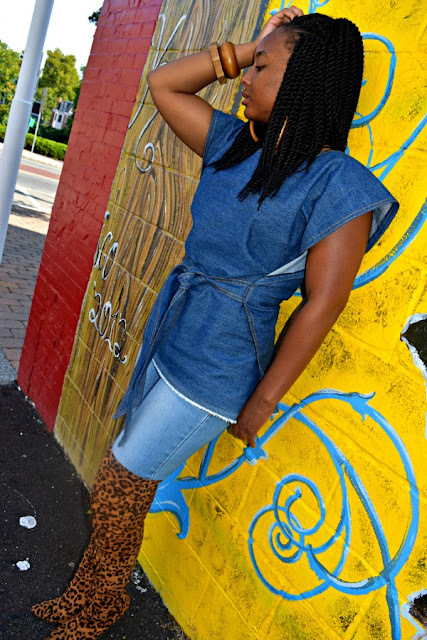 Thanks for the denim inspiration! Ya know me likes some denim! Thank you. That is adorable! Thanks for the tutorial! I like this a bit longer for a fall vest or wrap like option. Thanks for another great idea. Your welcome Pat and I'd love to see you make a version of this wrap shirt! 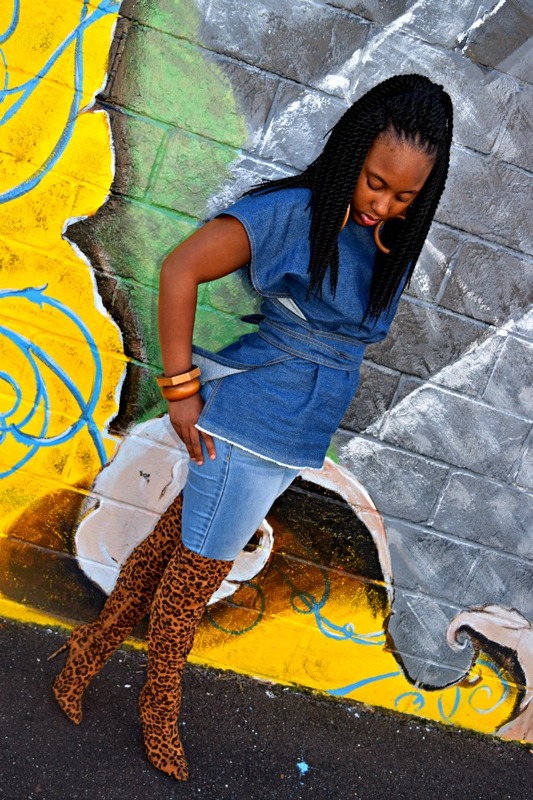 That wrap shirt is fabulous, but I NEED those boots!!! They are divine! Stay focused now! lol, they are hot right! You are AMAZING! 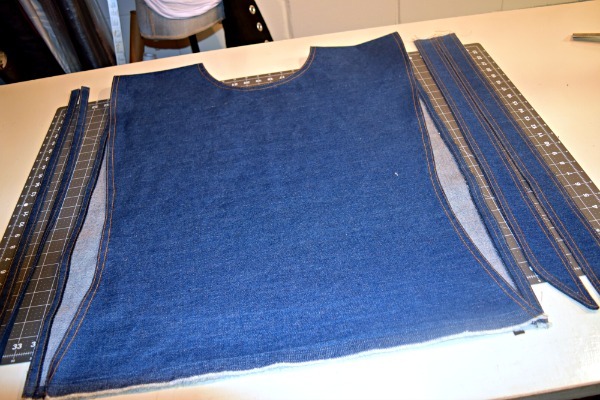 Making this in blue denim to wear with black leggings and a black turtleneck. It's almost Autumn in New York and this would be perfect! Thanks so much for sharing! That sounds pretty good to me!